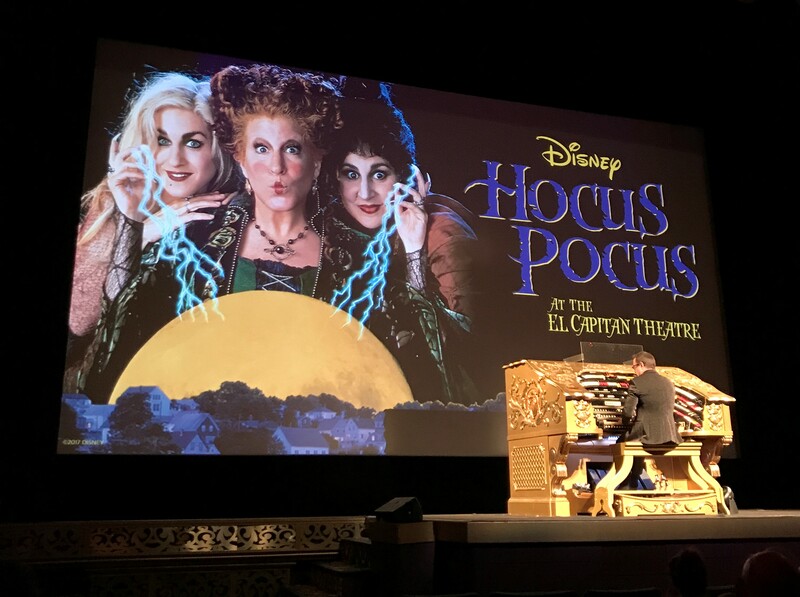 Every year, one of the things I look forward to the most around Halloween time is all the fun and magic at The El Capitan Theatre in Hollywood! This 91 year old theatre, with it’s ornate decor and rich history is the perfect setting for spooktacular fun. Tim Burton’s The Nightmare Before Christmas (from October 20-31st), as well as Disney Halloween classic Hocus Pocus (October 6-15th) return to the big screen at El Capitan. I had the pleasure of seeing Hocus Pocus yesterday on it’s opening weekend this season, and had the most amazing experience seeing my personal favorite Halloween film! Before seeing the films, you can head downstairs to see costumes and props from Nightmare Before Christmas and Hocus Pocus. I then had the amazing opportunity of getting to meet and interview Hocus Pocus director Kenny Ortega (Newsies, High School Musical, Descendants), and the film’s composer John Debney. Even 24 years after the original film’s release, it was easy to see that Ortega and Debney were still very passionate about Hocus Pocus, and reminisced on it fondly. Ortega talked about how there was never a dull moment on set, and was continuously on the floor laughing at the ad libbing from Middler, Parker, and Najimy. Debney told us that being brought on to do a Disney film was a dream come true, since his father worked at Disney for 45 years. Debney grew up in a Disney environment, even knowing the Sherman brothers. Growing up with Disney music and classic Disney films was a big inspiration to his style and compositions and is honored to have been part of a legendary Disney film himself. Right before the film began, Ortega and Debney took to the stage to chat a little about Hocus Pocus, and something they both want to happen some day: A sequel with the original cast! A project they are both on board for, as well as the original cast, and dream for it to become a reality one day. (This was very exciting news for this Hocus Pocus fan). You can see Hocus Pocus from October 6-15th, and Tim Burton’s Nightmare Before Christmas October 20-31st at The El Captian Theatre in Hollywood. You can find ticket information here.